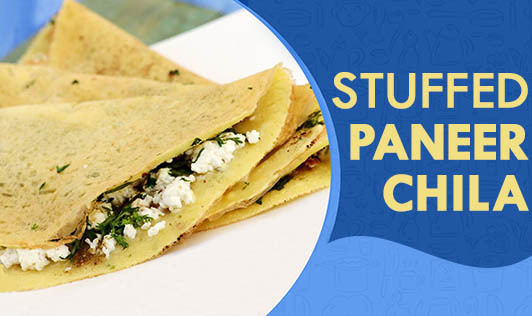 Teeming with flavor and nutrients, stuffed paneer chila is one dish you can have at any time of the day, be it breakfast, snacks, or supper. It can be prepared within a few minutes and is an awesome treat when you have sudden guests. 1. Drain and blend the soaked moong dal along with ½ cup water until smooth. 2. Add ginger-green chili paste, hing, sugar, and salt to the batter. Mix well and keep aside. 3. Mix paneer, pudhina, coriander, green chilies, chaat masala, and salt together and divide the mixture into 4 equal parts. 4. Heat a non-stick tava, add 1 tsp of oil, now pour the batter on the tava and spread it evenly to make a chila of 5" diameter. 5. Spread a portion of paneer stuffing evenly over it and press it gently so that the stuffing sticks to the chila. 6. Cook till turns golden brown on both sides. 7. Serve immediately with pudina chutney.